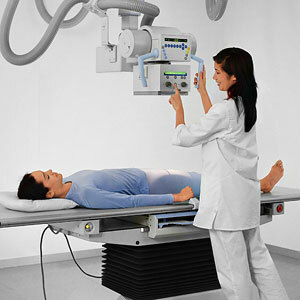 X-rays are the oldest and most popular form of diagnostic medical imaging. They are performed using a form of ionizing radiation that is projected through the body onto a piece of specialized film. Different tissues have different densities and therefore absorb this radiation in different amounts, causing the film to record only what is not absorbed. It is the same principle used by photo cameras to capture images using visible light. X-rays use very low doses of radiation and therefore are often done before more complex testing. At Independent Physician Medical Center the Siemens Multix system is specially designed for general x-ray of routine, trauma, and orthopedic examinations. It features outstanding image quality with minimal radiation dosage and provides the capability for a wide range of applications, including examinations of the skull, spinal column, abdomen, and extremities. These procedures can be performed on patients in a lying, sitting, or standing position. X-rays are mostly used to view bones, though there are several kinds of x-rays that concentrate on soft tissues. They are very quick and completely painless and non-invasive.